The Toufayan family’s passion for baking with quality and care continues three generations after it first began. 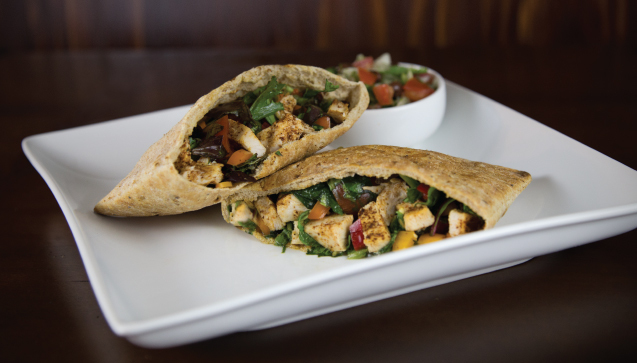 So when our customers asked for a more “user friendly” and healthy pita to make sandwiches, we set out to reinvent the pita. We are proud to have created Smart Pockets™. It’s the most wholesome, convenient, and soft pocket pita bread for the needs of today’s consumer. Your customers will enjoy the smart, new way to make a sandwich. Toufayan Smart Pockets™ are only 80 calories and come in three great flavors including Original, 100% Whole Wheat, and Everything. Hello, I was wondering if any of the smart pocket flavors are vegan or not, if any of them are vegan could you please give me a list of which are vegan? Thank you! Our All Natural Sprouted Grains Smart Pockets aren’t yet certified vegan, however, we don’t use any non-vegan ingredients. I am residing in Springfield, VA and was introduced to your smart pockets originals. I was getting the from wegmans in Alexandria but they no longer carry them so where do I now get them? Please ask your favorite grocer to stock our Smart Pockets™, you can have them call us at 1-800-328-7482 or ask them to visit our contact page. In Virginia, Some Wegman’s still carry Smart Pockets™, but it is up to each store manager to decide what products and varieties they stock. You can also try Shoppers, which carry Smart Pockets™ in your area. If you have the opportunity to visit a Publix, they carry our Organic Sprouted Whole Wheat Smart Pockets™ in some of their stores. Use our store finder for more details and areas. Also from Michigan here. I found the Organic Sprouted Whole Wheat Smart Pockets at my local Meijer store. However, I am unable to determine the use by date. Please help! We recommend to our grocers that they code our Smart Pockets™ for a 10 day shelf life. Sometimes they print the code near the seal of the bag, which might be lost when opening them for use. Some grocers use a sticker. We have found that as long as we keep them well sealed and store them at room temperature, they easily last those ten days and more. They’ll start to get a stale or stiff texture after their shelf life ends, which will occur sooner if exposed to air, moisture or extreme temperatures for too long. If you keep Smart Pockets™ or any bread products in your refrigerator, make absolutely certain to seal them very well with little or no air inside the package to minimize the chance of condensation. Meijer use to carry the wheat Smart Pockets but now only the organic sprouted. I’ve been talking the product up for years, even requesting that Meijer’s distributor provide more inventory, since they seem to be out often. However, the Organic-Sprouted seems to be a wee bit smaller than the wheat. The larger size and rectangular shape allowed for more ingredients without bursting at the corners PERFECT. I know they are different sizes by measuring a single slice of cheese that I always use. The pocket now bursts way too easily, where it did not use to do that. Are they two different sizes or what? And if so why? Hello Stephen and thanks for your your interest. Size differences between varieties of the same product are surely not intentional. The differing ingredients do yield different rises, but the portion is the same. Our portions are regulated to adhere to the FDA recommended serving sizes. Variations in the rise may make the dimensions slightly different, but both the Whole Wheat Smart Pockets and our new Organic Sprouted Whole Wheat Smart Pockets are portioned to 1.5 ounces each. Can u purchase the smart pockets on line direct from your website. What stores carry your smart pockets in Manhattan? Thank you for your interest in Toufayan Smart Pockets™! Currently, we do not have a online store, however many of our products are available online. If you do purchase our products online, please come back and leave a comment to let our community know about your experience. In your area, Acme, Fairway, Foodtown, Gristedes, King Kullen and Wegmans carry our Smart Pockets™. It is up to each individual store manager to stock Toufayan products or not, but those grocers already carry Smart Pockets™ and some of our other products. Please ask your favorite grocer to add Toufayan Smart Pockets™ to their inventories or to contact us directly. I love the smart pocket but can’t find them anymore!! Which stores in Brooklyn carry it,? Hello Chana and thank you for your endorsement! We’re sorry you’re having a hard time finding them in your area. Please try Fairway, Foodtown, Gristedes, King Kullen, Shop Rite, or Wegmans. Each store manager may choose to stock different varieties. Please ask your favorite grocer to add Smart Pockets™ to their inventory. Let us know if you find a grocer in your area who can help, or if you still have trouble. My name is Aladdin, do you do business directly with restaurants? I would like to order a large order for both my restaurants if possible! Hello Aladdin and thank you for your interest. Typically we work with local distributors to provide our products to restaurants. Please contact a representative directly for more information. Call 800-328-7428 or visit our contact page. I found these Everything Smart Pockets during a healthy lifestyle change. I loved to make a reasonable sandwich with these delicious pitas. I found them in the deli section of my local grocery, but unfortunately, every local grocery who use to carry them in the Lansing, MI area, no longer carries them. The closest thing I can find is the Organic sprouted whole wheat pitas that have more calories and although they’re still good, they’re not as tasty as the everything flavor. So disappointed. I even scoured the web trying to find somewhere I could order them and freeze them, but was unsuccessful. Hello Denny and thank you for your interest in Toufayan Smart Pockets™. There are currently 3 grocers within Michigan that have Toufayan’s Everything Smart Pockets™ available to them. Those stores include: Martin’s, Spartan Stores and Valuland. I love your Original Smart Pockets! They taste great and are only 2 Weight Watcher points each! I enjoy them for my lunch at work filled with thinly sliced lunch meat and fresh lettuce. Delicious!! I’ve also enjoyed them filled with scrambled eggs and salsa at breakfast for a very filling “low point” meal. Food Lion grocery store has them in my area of Virginia but they sell out regularly. Great product. I LOVE your smart pockets! They taste good, they don’t sit real heavy, and they are healthy! I wish I could find more products in the stores near me!! Hello Sarah and thank you for your endorsement! Don’t forget to check out our store finder for stores in your area that carry our products. Also, please ask your the manager at your favorite stores to add our products to their inventories! Let us know if you still can’t find Toufayan products in your area. Toufayan Smart Pockets™ aren’t available across California yet, but you can check Albertson’s, Walmart, Savemart or Sprouts, as these grocers carry many of our other products. Please ask your grocer to add your favorite Toufayan products to their inventories. Let us know if you still have trouble or if you do find them in your area. I have the same question! Bought them on East Coast, at a Food Lion. I was told they’re only on East Coast. I’m waiting in line with you. They’re awesome! We found these just recently at Walmart. They recently deleted the item. Looked at every store in town. Apparently they are no longer available in Lubbock, TX. They are very good with low fat and calories. Have you tried BGC Brookshire? They carry Smart Pockets in Texas. Be sure to ask your store manager to add or replace Smart Pockets™ in their inventory. Also, you can try an online store such as Breadberry.com, which will ship Smart Pockets to your home. Let us know if you find it somewhere else, or if you do try Breadberry, what you think of their service. Brookshire no longer carries Smart Pockets. I am going to have to buy them online – it’s ridiculous that they no longer carry them, yet the lady in their bakery said that people always bought them. I’ll just order online. We’re sorry you can’t get them at your grocer. We’ll tell our sales rep about it, but your store is sure to take your interest to heart as well. Please mention it to your store’s manager. Meanwhile, if you do find them online, please tell this community about your experience! I am extremely happy with these Toufayan smart pockets. They taste delicious and I can stuff them with sprouts and tuna salad and tomatoes, and not get juices all over the place. I was reluctant to try them at first because one of the bagel thins bread packages I bought in another brand tasted so bad. We’re glad you like them! They are a staple in our health-conscious household as well. If you send us a picture and a recipe, we’ll feature it on our site, with credit to you! I am a new “big” fan of these Smart Pocket. I just changed my eating habits, so i am very happy to have found these pockets. I happened to see your Smart Pockets in a local grocery store, Market in the Square in West Seneca NY, and decided to try them because they were so reasonably priced. They are much better and much easier to use than similar products costing much more! I had never heard of your company before, but I am definitely a big fan now. Thanks very much and keep up the good work.